Fictional languages are central to numerous creative works. 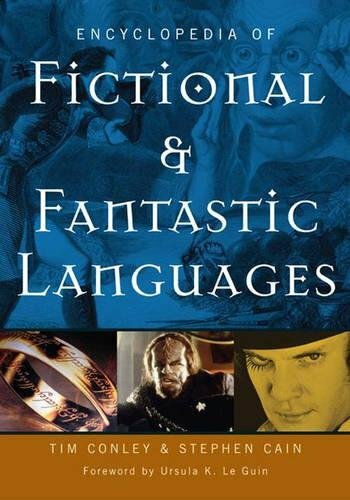 This book examines such languages in a wide range of literature, films, and television shows. Included are alphabetically arranged entries on particular works. Many of these works are widely taught, such as All's Well That Ends Well, Gulliver's Travels, Nineteen Eighty-Four, and Utopia, while others are popular books, films, and television series, such as Buffy the Vampire Slayer, Cat's Cradle, The Lord of the Rings, and Star Wars. Thus the encyclopedia helps students understand texts central to the curriculum and popular culture. Each entry discusses the role of imaginary languages in a particular work. Entries range from antiquity to the present and close with suggestions for further reading. The encyclopedia ends with a selected bibliography and includes various helpful finding aids. Each entry discusses the features of the invented language central to the work and relates it to the film, literary text, or television program. Entries provide suggestions for further reading, and the Encyclopedia closes with a selected bibliography. Because many of the works discussed are central to the curriculum, the Encyclopedia will help students understand these texts and the importance of language. At the same time, the volume's coverage of popular books, films, and television series invites students to explore more critically those works that are most likely to interest them. View More In Encyclopedias & Subject Guides.